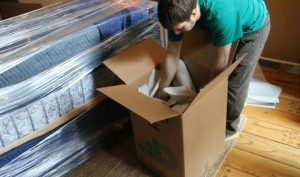 Moving boxes are usually the same weight and quality as ordinary shipping boxes, unless you decide to purchase some made from thicker cardboard that allows you to pack some heavier items. So, the most frequent question is, should I purchase new moving boxes or look for places where to get free boxes for moving and find some slightly-used from stores or friends who have recently done a move. On the other hand, you may decide to buy or rent plastic moving containers, which are also very useful and convenient for packing delicate and fragile items. The answer is usually found in a combination of need and cost. For expensive, fragile or sentimental items that you don’t want to be damaged in the move, it’s always best to be on the safe side and purchase new moving boxes. If you are concerned about the environment and want to make your move environmentally friendly, you may choose to buy or rent plastic moving containers that are reusable. 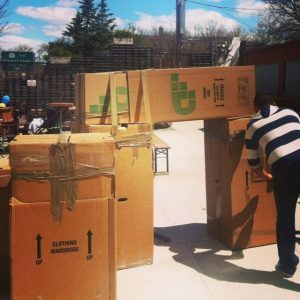 Professional moving companies like Dumbo Moving and Storage in Brooklyn, New York City offers a variety of plastic and cardboard moving boxes. Once you get in touch with the NYC moving company and make all necessary arrangements, the company will deliver moving boxes and can offer you some guidelines how to pack a moving box, if you’re not sure how you should properly pack them yourself. Also, when using plastic moving containers or bins, your NYC moving company will handle them easily since they are stackable and fit perfectly in a moving van or truck – more importantly, it helps fragile items arrive safely and undamaged to your new location. So, when choosing your moving boxes, whether you are purchasing new ones or decided on renting plastic containers, you need to ensure that you have enough moving boxes and that they do not overweigh. As a rule, each box should not weigh more than 50 lbs. Even if you’re using services of professional movers, remember that you’ll probably be moving the boxes from one room to another yourself, so make sure you’re able to lift them. Some boxes, such as a wardrobe or electronic box, may naturally be heavier. Just try to keep the number of boxes over 50 pounds to a minimum. Smaller boxes are usually suitable for videos/DVDs/CDs, household items, books, tools and other smaller heavy items, as well as individual fragile items when used with bubblewrap or wrapping paper and lastly tape is used to secure the individual box. 1.5 cubic foot moving box, which is 16 x 12½ x 12½ inches – the box used the most and can safely carry up to 60 lbs. Again, keep weight under 50 lbs. This box is great for books, for packing kitchen items, dishes, fragile and small appliances, lamps or shades. 3.0 cubic foot moving box, which is 18 x 18 x 16 inches and can safely carry up to 65 lbs. Perfect for clothing, pots and pans and electronics. Generally considered a multi-purpose box. 4.5 cubic foot moving box which is 18 x 18 x 24 inches and can safely carry up to 65 lbs. Great for larger lamps, linens and larger kitchen appliances. 6.0 cubic foot moving box, which is 22 x 22 x 21 ½ inches and can carry up to 70 lbs, but don’t overpack this box as it can become very heavy to carry. This box can be used for pillows, toys, large blankets and couch/chair cushions. 6.1 cubic foot moving box, which is 24 x 18 x 24 inches. This extra-large moving box is a rectangular shape and is ideal for moving or storing those really bulky but lightweight, items such as comforters, pillows, and towels. Useful for objects that do not fit properly into the 6.0 cubic box. Save time when packing up your clothing, and keep it wrinkle free, by using a hanging wardrobe box. You can keep items on the hanger and the shape of the box is just like a wardrobe. They are great for hanging closet items that you can’t pack flat. Just remember that they are heavy and take up a lot of room. If you can pack clothes flat, this will save you some money. Some movers use these boxes to move chandeliers or delicate wind chimes that are better to move hanging than flat. There is also room at the bottom of the box for other items, such as blankets, shirts. Just remember not to over-pack this box as it cannot withstand heavy items. Mirror boxes are designed to handle framed pictures, artwork, and mirrors. Bubble wrap is recommended for all framed items. All mirror boxes can be telescoped, meaning that two can be put together to get a longer fit. When fitting two boxes together, make sure you use strong tape to secure them together and to handle the additional weight. These are great for packing dishes, glasses, cups or liquor/wine bottles. There are various options on the market that include custom adjustable cardboard dividers, protective foam pouches that can fit within a moving box. Check the weight to ensure they are still manageable. Over packing, dish packs can result in dropped boxes and shattered items. These boxes aren’t necessary as most movers will wrap your mattress in plastic bags which are much cheaper to purchase. However, boxes will keep your mattress from being punctured, or if it’s being stored for a while, it’ll protect it better from outside forces. Mattress boxes come in many sizes from cribs to twin to king-size.